Only this week to make your donation tax deductible for 2011! I hope everyone had a great Christmas and are enjoying the holidays. My family and I are having a great road trip vacation, and we’ve just departed St. Louis and are headed to Madison Wisconsin. Here’s hoping the weather stays as cooperative as it has been. We’re very lucky as well that Patrick, our 1 year old, sleeps mostly in the car. There is one more week left in 2011, and that means tax season is right around the corner! Which means you’ve got one more week to have your class gift donation count toward 2011 tax year. If you’re looking to reduce your burden to Uncle Sam, now’s the time to act. James and I wish everyone a very happy New Years celebration. 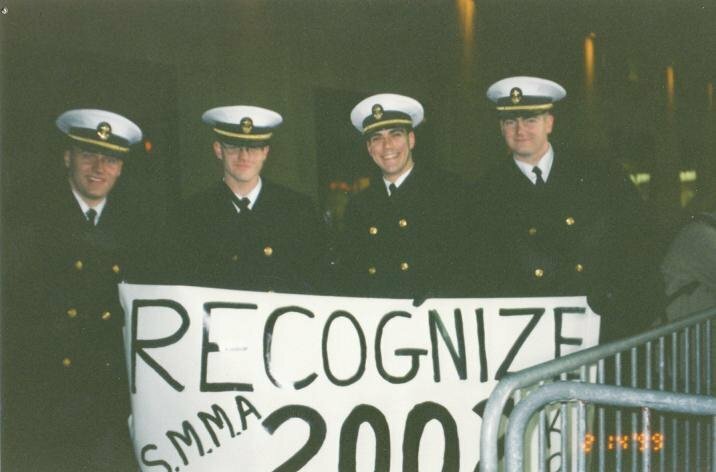 Is my gift to the USMMA Alumni Association and Foundation tax-deductible? Yes. Through the USMMA Alumni Association and Foundation, a tax-exempt organization under the Federal Internal Revenue Service Code Section 501 (c) (3), your gift to the USMMA Alumni Association and Foundationfor the U.S. Merchant Marine Academy is tax deductible to the fullest extent allowed by law. Please consult your tax specialist for details on your donation. Our 10th anniversary homecoming extravaganza is approaching, and I couldn’t be more excited. We are continuing to make the very early preparation for next falls events. I’ve got contact information for everyone, but much of it is horribly out of date. I’m going to attempt a group mailing in the new year to continue tracking everyone down. If any thing comes out of this entire party planning effort, I hope to at least have solid contact information for 100% of the graduating class. Tim Williamson and I have just registered the domain name http://www.usmma2002.com. Facebook is a great tool, (I certainly spend way too much time there) but for a variety of reasons, some people don’t want to be involved in social networking sites. We’d like a central location for information posting, updates on the reunion plans, etc that doesn’t rely on facebook or any other sites like it, to have a one stop shop for information on our party arrangements, costs, hotel blocks, van schedules, paypal links, etc. We’d like it to be a permanent home for our class where we can post updates on what we’ve been up too. Anyone who wants to help in this endeavor, please feel free to contact Tim and I, we’ll get you set up. If you have a personal website, small business (or large business) you would like to promote or share with your classmates, send an email with the address and we’ll add a link. Share life’s adventures with your classmates, or just reconnect. Tell us what you’re working on, send pictures and stories, birth announcements, engagements, deployments, power-ball jackpots, job openings, etc. Tim is going to be leading the charge as the Financial Chair for next years class gift. I’m not supposed to be involved in that, but we’ll be working together very closely on a number of projects to hopefully motivate people to get involved. The economy is in the toilet, a lot of us have mortgages, new businesses, wives, kids, etc. but with all that’s been going on at the academy the Alumni Foundation needs our help more than ever. Despite any hardships that I may have had at Kings Point, I regret nothing, and I look back at my 4 1/3 years there fondly. I hope to pay back a little of what the Kings Point family has given me over the past 14 years, and I hope you’ll join me. Stay tuned for more information from Tim, and let’s makes history with our 10 year anniversary class gift. Finally, I want to hear from all of you on what you’d like to see and do at homecoming, and most importantly we’d like to start getting head counts together. Please head over to https://usmma2002.com/vessel-registry/ and provide us with your latest contact information, as well as indicating how likely you are to attend, and if you’ll be bringing guests. I have some ideas, but I’d like to extend the offer to everyone to let me know what you’d like to do on Friday night, Saturday and Sunday. We’ll see what we can come up with to make it an event that that will take 5 years to recover from. Homecoming is on Saturday Sept 29th, 2012 and it will be here before you know it. Best wishes for a wonderful holiday season, and a happy and healthy new year for you and your families. As we gather with our family and friends for the holidays and we usher in 2012, the class of 2002 will hit a major waypoint in our departure voyage from Kings Point. Various courses were taken as the last lines were cast, but we’ve all gone on to make our own unique marks in the world. It’s amazing to see how members of the class of 2002 are making their contributions around all corners of the world; some have even had a hand in shaping mankind’s reach to the furthest reaches of space. We have pursued our dreams, and as a result have contributed mightily to our families and society. In short, the class of 2002 is the best class to have graduated from Kings Point in quite a long time. It feels like we were just abreast of mile marker 5, but mile marker 10 has just been spotted. Our ten year reunion is an occasion for celebration of those four or more years that prepped us for our life journeys, as we reminisce all that we experienced from indoctrination to passing our license exams, the good and the bad together. We hope we can all raise a pint together at homecoming, reconnecting with each other and swapping old and new sea stories. Along with having a great time during homecoming weekend, it would be appropriate to present a class gift to our alma mater that was symbolic of the amazing things we’ve all gone on and accomplished. As much as we have had an impact on our families, our places of employment, and the armed forces, we still have an opportunity to contribute to our Academy, despite the passage of time. As you’ve probably heard, our beloved Kings Point has fallen on some trying times. A lot of seemingly questionable actions and decisions have been made by MARAD that has impacted negatively the Kings Point experience and core traditions. The existence of June Ball has even been questioned, just to give an example of some of the lunacy going on. Despite all this, and the crisis of leadership that has persisted the last few years, the regiment is as strong as ever, in large part to the contributions of Alumni and dedicated friends of the academy. There is no question that our action and participation is needed to ensure the education and experiences we’ve received is available for the next generation of Kings Pointers. Our five year gift wasn’t up to par with the greatness of our class, but hey we were still getting our sea legs. Acta non Verba! Remembering our motto, we have set two ambitious goals for our class gift. First, we are striving for 100% participation of class members in providing a donation. In these trying economic times, and knowing that we are all still young and finding our way, everyone has varying degrees of capability in providing a donation, but we hope that at least every member of the class of 2002 can contribute something to this cause. For on less than the cost of your monthly utility bill or probably your cell phone bill, you can show that 2002 stands proudly together in supporting our school. Secondly, we want to make our mark as a class by beating the record in what is donated by a class on their ten year reunion. With a contribution of $200.20 over the course of the next year, the amount we are asking everyone to consider, we will set records for fund raising for a 10 year class gift. Some may want to give more, and we are setting a top tier goal of $2002 (which would earn you membership to the Alumni Foundation’s Superintendent’s Council). If a few can meet this goal, we will cruise past older reunion classes; give the regiment in the stands something to really cheer about, as well as giving the Alumni Foundation something to marvel at. As we march onto the field, we’re hoping to present our class gift in the amount of $50,000. While it may take some time to determine what you can afford to give, please consider making a small donation now, to kick this effort off on a positive note as 2011 draws to a close, especially if your company matches gifts. Matching gifts from this year (2011) will be applied to our class total, depending on when your employer pays out, gifts from calendar year 2012 may not arrive in time to count. Best wishes for a Happy and Healthy holiday season, and a prosperous new year! There are 281 days until our 10th Anniversary Reunion. P.S. Jim and I are hoping to make this process a fun one, and we’ll be unveiling donation tiers for 2002’s own award ceremony during homecoming weekend. Stay tuned! Hat tip to gCaptain, and their continued coverage of Kings Point news with regards to MARAD’s (mis)management. P.S. If you haven’t heard, GMATS is gone too. Scheduled to be dis-enrolled in the summer of 2012. Posted by James Trynosky in Welcome! Since the days of wasting countless hours scouring the internet as a plebe candidate for MP3’s and super low quality transfers of popular films, one thing has not changed… internet fads rarely last. From IRC, to Napster, to Scour, the Pirate Bay, etc, they come and go. Most of us probably learned to type on AOL instant messenger and ICQ (Mavis Beacon has nothing on instant messenger), who still uses this stuff? We interact on the web in evolving ways, right now Facebook is the king of the internet, last year it was Myspace… as twitter grows, perhaps it will take over as the big thing next year. Unless your running an old geocities site, people will probably always use websites, so we’ve set this up as the home base for our class on the internet. What ever fad comes next, or when facebook decides to archive group pages again, or for the folks that can’t stand social networking, we’ll have this site to come home to for the latest scuttlebutt, reunion plans, and what ever else we want to make it. Now that I’ve typed this, I’m expecting an email at any moment to tell me wordpress is being shut down, but until that day comes, welcome to our new web stomping grounds and please pardon the mess as we put this thing together. Posted by tpwilliamson in 10 Year Reunion, Welcome! Welcome to class of 2002’s reunion page. Here are some key points as we kick off our reunion effort. Let’s get this party planning started now. Please provide comments, suggestions, and scuttlebutt to: jtrynosky@usmma2002.com and/or tpwilliamson@usmma2002.com. We look forward to hearing from you. It’s time we start getting recognized as one of the best classes to have graduated from that fine institution. To do that, we need to make our mark with our class gift. Please visit the donation page to get started!